Aunt Bucky made a 2014 new year resolution to NOT purchase any new clothes, but instead all new clothing pieces would either made from repurposed garments or from her huge stash of vintage fabrics. 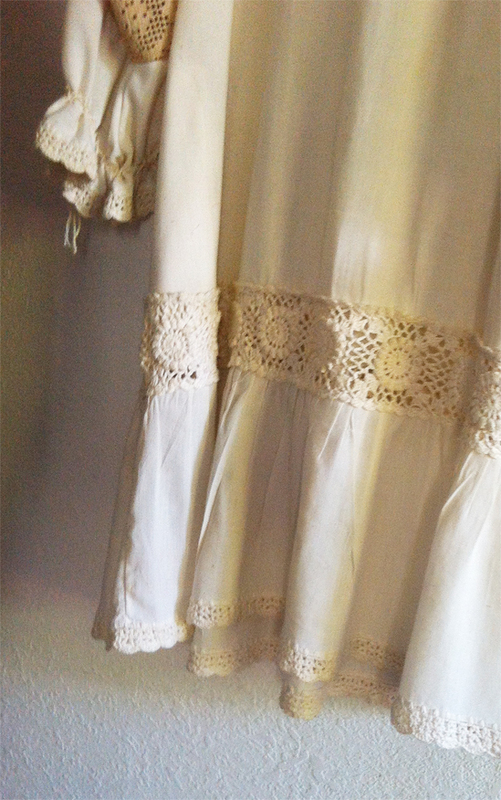 This ‘Get To Know Aunt Bucky’ post is about her repurposed Muu Muu floor-length gown to Boho Peasant above-the-knee dress that came about after she discovered a hideous vintage Muu Muu at the thrift store. Aunt Bucky loves spending time rummaging through the thrift stores/flea markets looking for mid-century goodies. She sometimes finds great clothes but they are either not the right size or just plain ugly, but they seem to have something she loves! 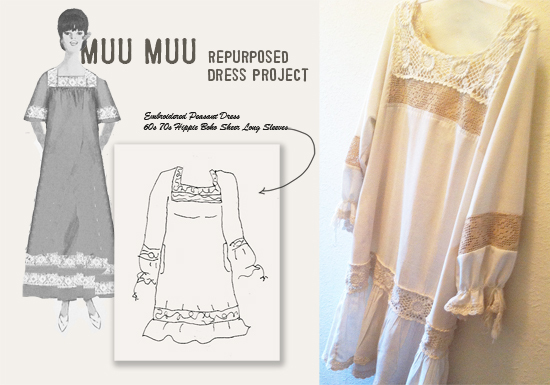 In this case, she loved that the Muu Muu was made out of a beautiful cotton gauze fabric and that it had beautiful embellishments of macrame trim. 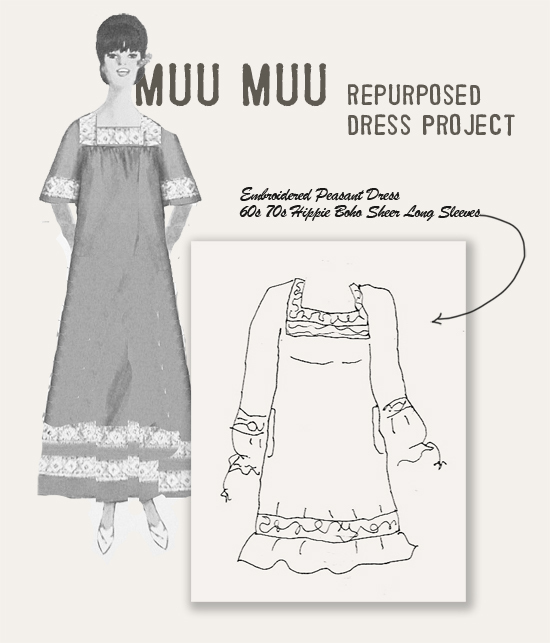 We all know that a Muu Muu is not for all, and Aunt Bucky envisioned a sort of Zooey Deschanel type-of-dress and quickly came up with the sketch above. 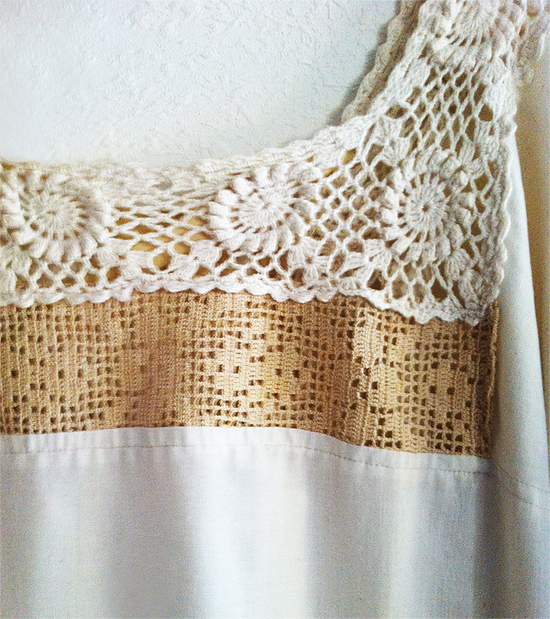 The macrame embellishment and the lovely fabric were just too good to pass up and so the $10 Muu Muu dress was on it’s way out of the store to be cut-up and repurposed into a new more modern cut design: Boho Peasant Dress above-the-knee design. One thing that Aunt Bucky loved about the Muu Muu was the bottom ruffle/gathered hemline. She just cut it off and made into a sweet above-the-knee length. She also added a new long sleeve design and used cotton heavy cord to make a gathered ruffle cuff on the sleeves, it seems to make it more boho and hippie-like. So, Aunt Bucky is very pleased how this transformation from ugly Muu Muu dress to awesome super sweet Boho Peasant dress turned out! Aunt Bucky is feeling good about this repurposed project and her commitment to NOT purchasing new clothes but making all new clothes this 2014!